Bagcilar Medical Bulletin is a peer reviewed English journal aiming to publish original research, current review articles, case reports and letters related to all medical fields. The journal is currently published quarterly as online publication. The articles will become freely available to all readers in pdf format as soon as they have been accepted after peer review. Accepted articles will immediately appear as a part of the issue belonging to that publication period. The journal is currently published by Yerküre Publishing. The journal is using online manuscript submission, review and tracking systems. The journal gives high priority to original studies in publication because of aiming to add the findings of searches in Turkey to international scientific knowledge, to share them within the international science milieu and to constitute the introduction of Turkish scientists. The review articles to be published in the journal are authorized by the editor to the relevant authors working on the subject. Papers that have not been published before or under evaluation by other publications are accepted for evaluation by the journal, if approved by each of the author. Publication board may amend manuscripts upon informed consent of authors. Editors and redactors are fully empowered to correct mistakes related to orthography, citation as given in National Library of Medicine MEDLINE/PubMed Resources . Short presentations that took place in scientific meetings can be referred if announced in the article. The editor hands over the formally acceptable papers to at least two national/international referees for evaluation and gives green light for publication upon modification by the authors in accordance to the referees' claims. Changing the name of an author (omission, addition or order) in papers submitted to the journal requires permission of all declared authors. Refused papers and graphics are not returned to the author. It is authors’ responsibility to ensure that the article is in accordance with scientific and ethical standards and rules. And authors should ensure that submitted work is original. They must certify that the manuscript has not previously been published elsewhere or is not currently being considered for publication elsewhere, in any language. Applicable copyright laws and conventions should be followed. Copyright material (e.g. tables, figures or extensive quotations) should be reproduced only with appropriate permission and acknowledgement. Any work or words of other authors, contributors, or sources should be appropriately credited and referenced. The author(s) must have contributed to the submitted manuscript and must declare that they were involved in substantial contributions to the conception or design of the work; or the acquisition, analysis, or interpretation of data for the work; drafting the work or revising it critically for important intellectual content; final approval of the version to be published; and agreement to be accountable for all aspects of the work in ensuring that questions related to the accuracy or integrity of any part of the work are appropriately investigated and resolved. Those who do not meet all the above criteria should be named in the acknowledgements. Fund raising, data collection or supervision of the research group are not sufficient roles to be accepted as an author. The order of names in the author list of an article should be a co-decision and it should be indicated in the Copyright Transfer Form. The individuals who do not meet the authorship criteria but contributed to the study should take place in the acknowledgement section. Individuals providing technical support, assisting writing, providing a general support, providing material or financial support are examples to be indicated in acknowledgement section. Written informed consent should be taken from the persons whose participations are indicated in the acknowledgement section. All authors must disclose all issues concerning financial relationship, conflict of interest, and competing interest that may potentially influence the results of the research or scientific judgment. All financial contributions, supports or sponsorship of projects must be clearly explained. Editors are responsible for the contents and overall quality of the publication. They should publish errata pages or make corrections when needed. Editor-in-Chief does not allow any conflicts of interest between the authors, editors and reviewers. Only he has the full authority to assign a reviewer and is responsible for final decision for publication of the manuscripts in Bagcilar Medical Bulletin. Please review the COPE publication ethics guidelines on https://publicationethics.org/files/u7141/1999pdf13.pdf Reviewers evaluate manuscripts based on content without regard to ethnic origin, gender, sexual orientation, citizenship, religious belief or political philosophy of the authors. They should have no conflict of interest with respect to the research, the authors and/or the research funders. Their judgments should be objective. Reviewers should identify the relevant published work that has not been cited by the authors. They must ensure that all the information related to submitted manuscripts is kept as confidential and must report to the Editor-in-Chief if they are aware of copyright infringement and plagiarism on the author's side. 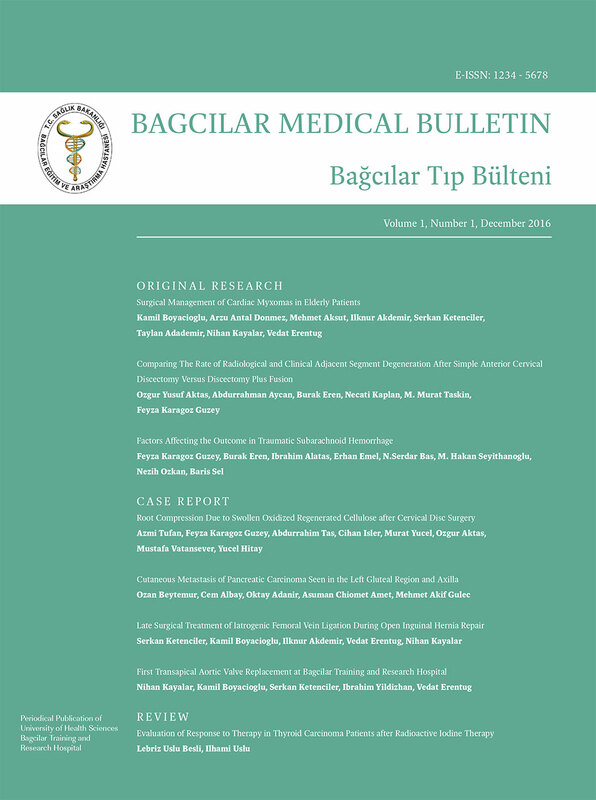 Bagcilar Medical Bulletin is committed to upholding the highest standards of publication ethics and observes the following principles of Publication Ethics and Malpractice Statement which is based on the recommendations and guidelines for journal editors developed by the Committee on Publication Ethics (COPE), Council of Science Editors (CSE), World Association of Medical Editors (WAME) and the International Committee of Medical Journal Editors (ICMJE). For this reason, regarding the subjects of clinical experiments, it should be indicated in the submitted manuscripts definitely that the above mentioned codes of conduct were applied. Besides approvals, from national or local ethical committees should be sent together with the papers as well. Manuscripts that report the results of experimental investigation with human subjects must include a statement that informed consent was obtained after the procedure(s) had been fully explained. In the case of children and those under wardship or with confirmed insanity, authors are asked to include information about whether the legal custodian's assent was obtained. And a letter of affirmation signed by all authors, confirming the collection of informed consents has to be sent to the journal. Identifying information such as names, initials, hospital numbers, dates, photographs, and family pedigree must be avoided, unless disclosure is allowed by written consent of patient or the legal custodian of the patient. Informed consent for this purpose requires that an identifiable patient be shown in the manuscript to be published. Patient consent should be written and archived either with the journal, the authors, or both, as dictated by local regulations or laws. It must be mentioned in the text that informed consent was obtained from the participants. Especially for case report, identifying information should be avoided as much as possible. Eye masking on photos is not sufficient to conceal the identity of the patient. Authors have to stipulate lack of impact on scientific significance in case of changing the identifying information. Written informed consent should be taken from the patients presented in case studies; and it should be indicated in the manuscript. Authors have to confirm in the section "Materials and Methods" that study has been conducted in compliance to above mentioned principles, approvals have been obtained from related institutional ethical committees and informed consents were collected. When reporting experiments on animals, authors should indicate whether the institutional and national guides for the care and use of laboratory animals were followed as in "Guide for the Care and Use of Laboratory Animals" (www.nap.edu/catalog/5140.html) and approval from ethical committee should be taken. The editor and the publisher do not guarantee or accept responsibility for the published features or definitions of commercial products. If there is direct or indirect grant support, it should be acknowledged in the section titled "declaration of interest" and should include the full name of the sponsor and grant number. Existence or lack of sponsorship of any kind as well as the type of sponsorship (consulting etc) has to be acknowledged, as well. adopts WAME's definition http://www.wame.org/about/wame-editorial-on-coi which states that conflict of interest exists when author, peer reviewer or editor has a competing interest that could unduly influence (or be reasonably seen to do so) his or her responsibilities in the publication process. The types of competing interests that should be declared include financial ties, academic commitments, personal relationships, political or religious beliefs, institutional affiliations. The conflict of interest is to be acknowledged in the manuscript. The language of the Bagcilar Medical Bulletin is American English. In addition, abstracts of the articles are published in both English and Turkish, and abstracts in both languages are requested from the authour/s. All correspondence will be sent to the first-named author unless otherwise specified. Papers should be accompanied by a cover letter indicating that the paper is intended for publication and specifying for which section of the Journal it is being submitted (i.e., original research article,brief research article, review article, case report or letter to the editor). In addition, a Copyright Transfer Form, Author Contribution Form and ICJME Form for Disclosure of Potential Conflicts of Interest must be submitted. Authors will be notified of the receipt of their paper and the number assigned to it. The number should be included in all further correspondence. All parts of the manuscript, including case reports, quotations, references, and tables, must be double-spaced throughout. All four margins must be at least 2.5 cm. The manuscript should be arranged in the following order, with each item beginning a new page: 1) title page, 2) abstract, 3) text, 4) acknowledgement 5) references, and 6) tables and/or figures. All pages must be numbered consecutively. On the title page, include full names of authors, academic or professional affiliations, and complete address with phone, fax number(s) and e-mail address (es) of the corresponding author. Acknowledgments for personal and technical assistance should be indicated on the title page. Title of the manuscript in English should be written in English abstract, and a Turkish title must be for Turkish abstract.. All articles should include abstract and keywords. For abstracts are most distinct parts of an article and take place on the electronic databases, author should be sure that abstract represents the content of the article accurately. Abstract should inform about the basis of the study and include the purpose, basic procedures (selection of cases and laboratory animals, observatory and analytical methods), key findings and conclusions. New and significant apects of the study or observations should be stated. Up to 3-10 key words in English and in Turkish should be in accordance with National Library of Medicine’s Medical Subjects Subheadings (MeSH). Original research articles report substantial and original scientific results within the journal scope. Original research articles comprised of Abstract, Key Words, Introduction, Material and Methods, Results, Discussion, Conclusion, References and Table/Figures. The abstract should be structured as the following. The abstract should be no longer than 500 words and structured as follows: objective, method, results, and conclusions. Objective -the primary purpose of the article; Material and Method(s) -data sources, design of the study, patients or participants, interventions, and main outcome measures; Results -key findings; Conclusions -including direct clinical applications. Up to 3-10 key words in English and in Turkish should be in accordance with National Library of Medicine’s Medical Subjects Subheadings (MeSH). This section should contain a clear statement of the general and specific objectives as well as the hypotheses which the work is designed to test. It should also give a brief account of the reported literature. The last sentence should clearly state the primary and secondary purposes of the article. Only, the actual references related with the issues have to be indicated and data or findings related with the current study must not be included in this section. This section should contain explicit, concise descriptions of all procedures, materials and methods used in the investigation to enable the reader to judge their accuracy, reproducibility, etc. This section should include the known findings at the beginning of the study and the findings during the study must be reported in results section. Ethics Committee Approval of the research and written Informed Consent obtained from the participants should be indicated. The methods, apparatus (the manufacturer’s name and address in parentheses), and procedures in sufficient detail must be defined to allow others to reproduce the results. References to established methods, including statistical methods (see below) must be given and brief descriptions for methods that have been published but are not well-known must be provided; new or substantially modified methods must be described, the reasons for using them must be given, and their limitations of the methods must be evaluated. The all drugs and chemicals used, including generic name(s), dose(s), and route(s) of administration must be identified. Authors submitting review manuscripts should include a section describing the methods used for locating, selecting, extracting, and synthesizing data. These methods should also be summarized in the abstract. The results should be presented in logical sequence in the text, tables, and illustrations, giving the main or most important findings first. The all the data in the tables or illustrations should not be repeated in the text; only the most important observations must be emphasized or summarized. Extra or supplementary materials and technical detail can be placed in an appendix where they will be accessible but will not interrupt the flow of the text, or they can be published solely in the electronic version of the journal. The findings of the study, the findings and results which support or do not support the hypothesis of the study should be discussed, results should be compared and contrasted with findings of other studies in the literature and the different findings from other studies should be explained. The new and important aspects of the study and the conclusions that follow from them should be emphasized. The data or other information given in the Introduction or the Results section should not be repeated in detail. Conclusions derived from the study should be stated. For experimental studies, it is useful to begin the discussion by summarizing briefly the main findings, then explore possible mechanisms or explanations for these findings, compare and contrast the results with other relevant studies, state the limitations of the study, and explore the implications of the findings for future research and for clinical practice. The conclusions should be linked with the goals of the study but unqualified statements and conclusions not adequately supported by the data should be avoided. New hypotheses should be stated when warranted, but should be labeled clearly as such. Tables, graphics and illustrations should be numbered in Arabic numerals in the text. The places of the illustrations should be signed in the text. Detailed information is under the related heading in below. Brief researches are similar to original research in that they follow the same format and guidelines, but they consider small-scale research or research that is in early stages of development. These may include preliminary studies that has a simple research design or a small sample size and that have produced limited pilot data and initial findings that indicate need for further investigation. Brief researches are much shorter than manuscripts associated with a more advanced, larger-scale research project. They are not meant to be used for a short version of an article about research that would otherwise qualify for a full original research manuscript or for publishing material on research that lacks significance, is not rigorous or, if expanded, would not qualify for a full article or for research. Case reports consider new, interesting and intriguing case studies in detail. They should be unique and present methods to overcome any health challenge by use of novel tools and techniques and provide a learning source for the readers. Case reports comprise of: Abstract (unstructured summary), Key-words, Introduction, Case Report, Discussion, Reference, Tables and Figures. Written informed consent of the patient should be obtained and indicated in the manuscript. Review articles are written by individuals who have done substantial work on the subject or are considered experts in the field. The Journal invites authors to write articles describing, evaluating and discussing the current level of knowledge regarding a specific subject in the clinical practice. The manuscript should have an unstructured abstract representing an accurate summary of the article, key words, introduction, conclusion. Authors submitting review article should include a section describing the methods used for locating, selecting, extracting, and synthesizing data. These methods should also be summarized in the abstract. Letter to the Editor is short and decisive manuscript. They should be preferably related to articles previously published in the Journal or views expressed in the Journal. The letter should not include preliminary observations that need a later study for validation. Tables capture information concisely and display it efficiently; they also provide information at any desired level of detail and precision. Including data in tables rather than text frequently makes it possible to reduce the length of the text. Each table should be typed or printed with double spacing on a separate sheet of paper. The tables should be numbered consecutively in the order of their first citation in the text and a brief title for each table should be supplied. Any internal horizontal or vertical lines should not be used and a short or an abbreviated heading should be given to each column. Authors should place explanatory matter in footnotes, not in the heading. All nonstandard abbreviations should be explained in footnotes, and the following symbols should be used in sequence: *,†,‡,§,||,¶,**,††,‡‡ The statistical measures of variations, such as standard deviation and standard error of the mean should be identified. Be sure that each table is cited in the text. If you use data from another published or unpublished source, obtain permission and acknowledge that source fully. Additional tables containing backup data too extensive to publish in print may be appropriate for publication in the electronic version of the journal, deposited with an archival service, or made available to readers directly by the authors. An appropriate statement should be added to the text. Such tables should be submitted for consideration with the paper so that they will be available to the peer reviewers. Figures should be either professionally drawn and photographed, or submitted as digital prints in photographic-quality. In addition to requiring a version of the figures suitable for printing, authors are asked for electronic files of figures in a format (for example, JPEG or GIF) that will produce high-quality images in the Web version of the journal; authors should review the images of such files on a computer screen before submitting them to be sure they meet their own quality standards. For x-ray films, scans, and other diagnostic images, as well as pictures of pathology specimens or photomicrographs, sharp, glossy, black-and-white or color photographic prints should be sent, usually 127 x 173 mm. Letters, numbers, and symbols on figures should therefore be clear and consistent throughout, and large enough to remain legible when the figure is reduced for publication. Figures should be made as self-explanatory as possible, since many will be used directly in slide presentations. Titles and detailed explanations belong in the legends--not on the illustrations themselves. Photomicrographs should have internal scale markers. Symbols, arrows, or letters used in photomicrographs should contrast with the background. Photographs of potentially identifiable people must be accompanied by written permission to use the photograph. Figures should be numbered consecutively according to the order in which they have been cited in the text. If a figure has been published previously, the original source should be acknowledged and written permission from the copyright holder should be submitted to reproduce the figure. Permission is required irrespective of authorship or publisher except for documents in the public domain. Accompanying drawings marked to indicate the region to be reproduced might be useful to the editor. We publish illustrations in color only if the author pays the additional cost. Measurements of length, height, weight, and volume should be reported in metric units (meter, kilogram, or liter) or their decimal multiples. Temperatures should be in degrees Celsius, blood pressures should be in millimeters of mercury. Authors must consult the Information for Authors of the particular journal and should report laboratory information in both local and International System of Units (SI). Drug concentrations may be reported in either SI or mass units, but the alternative should be provided in parentheses where appropriate. All forms of support, including individual technical support or material support must be acknowledged in the author’s footnote before references. Original papers and reviews have no specific word limitation. A case report must be strictly limited to 1000 words excluding abstract and have minimal figures, tables, and references. Letters to the Editor (maximum of 500 words, including references; no tables or figures) will be considered if they include the notation “for publication.” A letter must be signed by all of its authors. Letters critical of an article published in the journal must be received within 12 weeks. Although references to review articles can be an efficient way to guide readers to a body of literature, review articles do not always reflect original work accurately. Readers should therefore be provided with direct references to original research sources whenever possible. On the other hand, extensive lists of references to original work on a topic can use excessive space on the printed page. Small numbers of references to key original papers often serve as well as more exhaustive lists, particularly since references can now be added to the electronic version of published papers, and since electronic literature searching allows readers to retrieve published literature efficiently. Using abstracts as references should be avoided. References to papers accepted but not yet published should be designated as “in press” or “forthcoming”; authors should obtain written permission to cite such papers as well as verification that they have been accepted for publication. Information from manuscripts submitted but not accepted should be cited in the text as “unpublished observations” with written permission from the source. Citing a “personal communication” should be avoided unless it provides essential information not available from a public source, in which case the name of the person and date of communication should be cited in parentheses in the text. For scientific articles, written permission and confirmation of accuracy from the source of a personal communication must be obtained. The Uniform Requirements style for references is based largely on an American National Standards Institute style adapted by the National Library of Medicine for its databases. Authors should consult NLM’s Citing Medicine (http://www.nlm.nih.gov/bsd/uniform_requirements.html) for information on its recommended formats for a variety of reference types. References should be numbered consecutively in the order in which they are first mentioned in the text. Identify references in text, tables, and legends by Arabic numerals in parentheses. References cited only in tables or figure legends should be numbered in accordance with the sequence established by the first identification in the text of the particular table or figure. The titles of journals should be abbreviated according to the style used in the list of Journals in National Library of Medicine sources. In addition the list should be obtained in the web address of http://www.nlm.nih.gov. Accuracy of citation is the author’s responsibility. All references should be cited in text. Type references in the style shown below. If there are more than 6 authors, list them followed by et al. Abbreviations of journal names should conform to the style used in National Library of Medicine. If a journal is not indexed in National Library of Medicine’s MEDLINE/PubMed, it should not be abbreviated. Crow SJ, Peterson CB, Swanson SA, Raymond NC, Specker S, Eckert ED, et al. Increased mortality in bulimia nervosa and other eating disorders. Am J Psychiatry 2009; 166(12): 1342-1346. Sevinçer GM, Konuk N. Emotional eating. Journal of Mood Disorders 2013; 3(4):171-178. Sharan P, Sundar AS. Eating disorders in women. Indian J Psychiatry 2015:57(Suppl 2): 286-295. Maner F. Yeme bozukluklarının tedavisi. Anadolu Psikiyatri Dergisi 2009; 10(Ek 1):55-56. McKnight TL. Obesity Management in Family Practice. 1st ed., NewYork: Springer, 2005:47-51. Eckel RH (editor). Treatment of obesity with drugs in the new millennium. In Obesity Mechanisms and Clinical Management. First ed., Philadelphia: Lippincott Williams & Wilkins, 2003:449-476. McGuffin P, Owen MJ, Gottsman II. Psikiyatri Genetiği ve Genomiği. Abay E, Görgülü Y (Çevirenler) 1st ed., Istanbul: Nobel Tıp Kitabevleri, 2009:303-341. •The findings of previous same studies should be informed and should be cited. The copies of previous same studies should be sent with manuscripts that might help to the editor in the decision process. •The knowledge of “all authors have read and accepted the study in its form, all authors meet the criteria for being in authorship” should be stated. •All helpful things for editorial ship should be stated: The comments of previous editor/reviewers and the response of authors should be added if the manuscript has been sent to another journal for consideration, previously. The editor requested this information to accelerate the publication process. It is hoped that this list will be useful during the final checking of an article prior to sending it to the journal’s editor for review. Please consult this Guide for Authors, for further details of any item. •Acknowledgement of the study “in accordance with the ethical standards of the responsible committee on human experimentation (institutional and national) and with the Helsinki Declaration of in 2000. •Statement that informed consent was obtained after the procedure(s) had been fully explained. •Indicating whether the institutional and national guide for the care and use of laboratory animals was followed as in “Guide for the Care and Use of Laboratory Animals”.